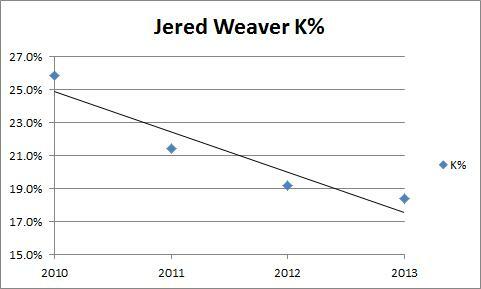 Jered Weaver has made a career out of outperforming his expected ERA metrics. In his first seven seasons, he has posted an ERA below his SIERA in six of those and sports a career 3.27 ERA versus a 3.94 SIERA. Along with Matt Cain, he has become the poster boy for the outlier group whose luck metrics don’t regress to the league average like the majority of Major League pitchers. He’s the exception to the rules. Of course, we know more now about how batted ball distribution affects some of these luck metrics, like BABIP, and we no longer consider Weaver as fortunate as we used to. Given his penchant for allowing fly balls and inducing pop-ups, it is no surprise that his career BABIP is just .271. 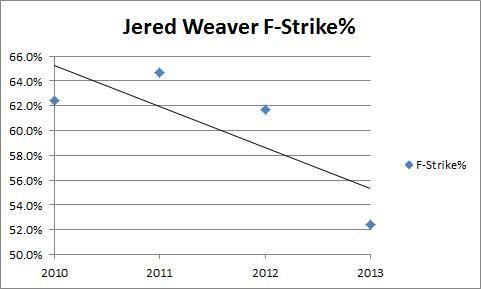 Weaver has always displayed solid skills with an above average strikeout rate, primarily due to a nasty change-up, and excellent control. The change-up is extremely effective, despite Weaver possessing underwhelming fastball velocity, especially for a right-hander. Unfortunately, the solid skills base that Weaver has established is slowly eroding. That means that his ability to suppress hits on balls in play and home runs on fly balls has to be taken up another notch in order for him to remain an elite pitcher. It’s time to look at some charts! Weaver has never owned a big fastball, as he averaged just about 90 mph when he debuted back in 2006. But check out this trend since 2010. This chart doesn’t need any explanation. The trend is straight downward. That’s a troubling sign, especially for a pitcher who’s experienced shoulder issues in the past. He’s getting to the danger zone in velocity, if he isn’t already there yet, whereby it makes it extremely difficult to remain a good pitcher, let alone a Major League quality one. 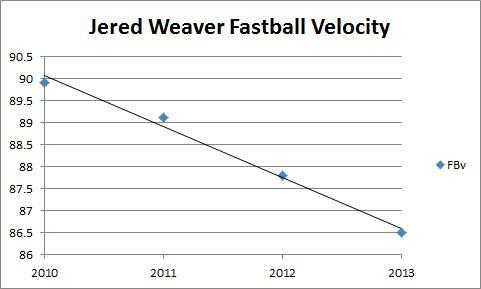 And given that declining fastball velocity, this next chart should come as no surprise. A lower strikeout percentage isn’t necessarily a terrible thing if it comes along with dramatically improved control. But, it hasn’t. And the underlying skills behind limiting walks — the rate of first pitch strikes and frequency of pitches thrown in the strike zone – are also headed in the wrong direction. 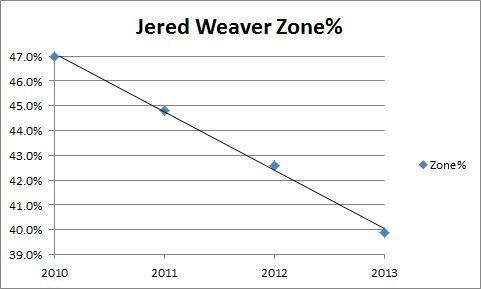 Weaver’s F-Strike% and Zone% have plummeted this season. Is all this just a matter of a small 34 innings sample size? Perhaps. But there are too many warning signs all rearing their ugly heads at the same time to just brush it off. There are some glimmers of hope, though. His expected strikeout percentage based on the breakdown of his called strikes, swinging strikes and foul strikes is 19.8%, a bit better than his current mark and higher than last year. Furthermore, his fastball velocity averaged 87.7 mph in his last start, which is nearly identical to his season average in 2012. It was just one start though, so we’ll know more in his next couple of outings when we learn whether his velocity has indeed rebounded. Whatever the case with the velocity, the significant decline in his ability to throw first pitch strikes and pitches inside the strike zone is worrisome. And last, Jeff Zimmerman’s new PAIN injury finder published in his MASH Report includes Pace as a factor. Zimmerman tells us that injured pitchers take longer between pitches, or in other words, experience an increase in Pace. 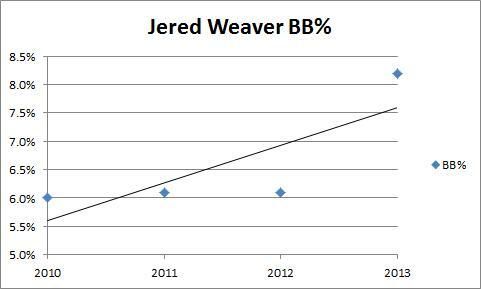 Well sure enough, Weaver’s current Pace is at a career high. I would be extremely concerned if I were a Weaver owner and would not be attempting to trade for him if his owner is considering selling. Whether it’s just an age-related skills decline or an injury, this is not the same Weaver we have grown accustomed to. We hoped you liked reading Jered Weaver’s Declining Skills by Mike Podhorzer! 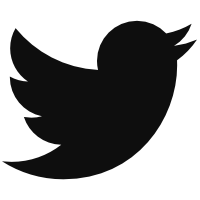 Awesome post with real tractable info! If you are going to do similar ones in the future, quantifying the slope of the trendline would be really nice. I can clearly see they look similar, but I think the case would be crazy persuasive if the BB% is the same or similar slope as the fastball velocity decrease (albeit different signs). Yeah, I’m having trouble equating BB% and velocity slopes too. I just can’t find the conversion factor anywhere to change walks into MPH so the units are the same. Google is no help. Maybe there’s some walkf/x data I can sift through? Is the speed that people go from home to first base after a BB what I’m looking for maybe?